Honda has introduced further models of its V-Twin engines. The electronic fuel-injected engines are designed for applications with demanding space requirements. The lineup is expended by four engines: the iGX700, iGXV700, iGX800, and iGXV800 models. They are designed for commercial construction and turf industry applications. Providing enhanced performance and quality, the engines are equipped with fuel injection technology and an integrated electronic self-tuning regulator (STR) governor that delivers drive-by-wire remote control capability to manage key aspects of engine operation. The engines, available in both horizontal and vertical shaft configurations, share the same footprint as existing models. The electronic governor allows the engine to regulate power when the load changes for the demanding commercial applications. This includes concrete and construction equipment (power screeds, hydraulic power units, concrete saws, ride-on concrete trowels, vibratory rollers, generators, and pressure washers) and commercial turf equipment (zero-turn radius mowers, lawn tractors, garden tractors, utility vehicles, trenchers, stump grinders, and chipper/shredders). Like the current GX630, GXV630 and GX690, GXV690 models, the new engines feature a hemispherical combustion chamber, an integrated cylinder and cylinder head, forged steel connecting rods and a 9.3:1 compression ratio, contributing to high efficiency as well as low noise and vibration. In addition, the integrated cylinder and head eliminate the need for a head gasket, resulting in superior cooling performance. The integration of electronic fuel injection (EFI), along with the advanced combustion chamber design and the integrated Digital Capacitive Ignition (CDI) with variable timing, results in improved fuel efficiency and enhanced operation. Adaptability: In addition to optimizing air/fuel ratios, the Honda V-Twin EFI-equipped engines offer improved ignition timing over the complete range of operating speeds and compensate for other factors to continually maintain optimal performance. 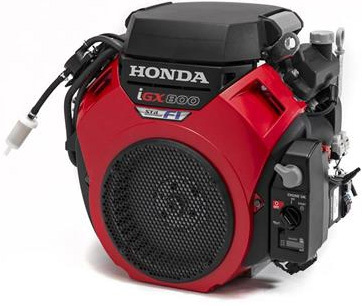 Starting: Honda iGX700, iGXV700 and iGX800, iGXV800 V-Twin engines boast starting performance in both hot and cold temperature conditions, such as when the equipment is started cold or temporarily stopped mid-job. The EFI system and high-pressure fuel pump allow for an ideal air/fuel mixture before it is emulsified and vaporized. In 2005, Honda introduced the computer-controlled iGX general-purpose engines. These engines featuring an integrated electronic control unit (ECU) deliver drive-by-wire remote control capability. Today, the Japanese engine supplier broadens its existing iGX lineup—the iGX270, iGX340, and iGX390—by integrating the ECU architecture into the GX Series V-Twin models. The launched engines represent the pinnacle of Honda’s general-purpose lineup and serve as an extension of the GX Series commercial grade engines. lawn mowers that can automatically vary engine speed based on load so the engine does not slow in thick grass. Because iGX engines eliminate the need for manual manipulation of the choke and throttle, they also are suitable for rental applications. Additional iGX design features include a digital ignition system; long-life air filter; automotive-style starter motor; low- pressure and high-pressure fuel pumps; engine temperature monitoring; and parameter-setting ECUs. The provided CAN-based J1939 connectivity enables a standardized integration of the engine into an in-vehicle network. This network can be used for control as well as diagnostic purposes. The added models feature a control panel with an LED indicator that informs the user about potential problems with diagnostic trouble codes. This indicator is designed either to stop the engine or alert the operator if any corrective actions need to be taken. These alerts protect and help extend the life of the engine.